MINNEAPOLIS — Teoscar Hernández had quite the blooper for Toronto on the basepath, a lapse in focus that could have proved costly. Two innings later, he more than made up for the mistake. 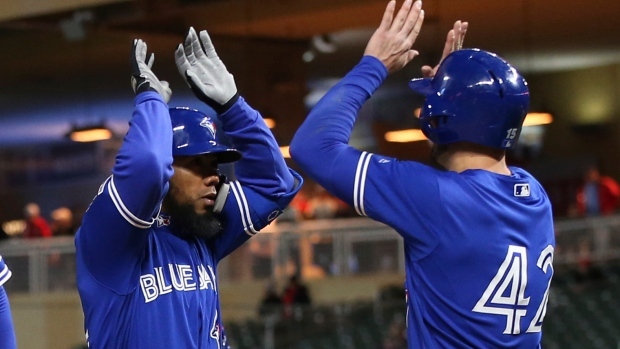 Hernández hit the go-ahead three-run homer in the eighth, giving the Blue Jays a badly needed offensive boost with three hits in a 5-3 victory over the Minnesota Twins on Monday night. "You forget about things like that when you do things good for the team," Hernández said. After his one-out single in the sixth inning with the Blue Jays trailing 3-1 against Martin Perez, Brandon Drury dropped his shin guard and began jogging to first base after drawing what he believed was a walk. But it was only ball three. Hernández left for second, prompted by Drury's advancement, and Perez alertly threw to C.J. Cron at first base to complete the unconventional caught stealing before Hernández could retreat. "I think I was a little distracted. I know that can't happen," Hernández said. "I know the situation, the count and everything. It was a bad moment." The 26-year-old left fielder, who had a breakout 2018 season with 22 home runs in his first crack at being an everyday player in the major leagues, sent an 0-2 slider from Adalberto Mejia (0-1) into the second deck for a 5-3 lead . "The last couple of games, I've been hitting the ball harder," Hernández said. "That's a good sign. I've been seeing a lot of pitches." After Perez finished six innings in his first start for the Twins with only one run allowed and Ryne Harper struck out two batters in a perfect seventh, left-hander Adalberto Mejia was summoned for the eighth with all righties due up for the Blue Jays. Freddy Galvis greeted Mejia with a single, Randal Grichuk doubled for his third hit of the game, and Justin Smoak hit an RBI single to bring up Hernandez. Mejia went to two strikes three of those four batters. "It's not like he did anything but just not put the hitters away, and that's something that we're going to have to do," Twins manager Rocco Baldelli said. After Hernandez saved starter Matt Shoemaker from his first loss with his new team, Joe Biagini pitched a perfect ninth for his first save. The Blue Jays, who won for only the fourth time in the last 14 games and entered the evening in the bottom five in most American League batting categories, had a season-high 11 hits. Sam Gaviglio (1-0) picked up the victory with a scoreless seventh. Shoemaker was one of only five pitchers in franchise history to win his first three starts with the Blue Jays, whom he signed with after five-plus years with the Los Angeles Angels and major forearm trouble over the last two seasons. The right-hander gave up four hits and four walks while striking out four. Jorge Polanco had three hits and raised his batting average to .420 for the Twins, who took a 3-1 lead in the fourth inning on Cron's three-run homer off Shoemaker but fell to 4-2 at home this season. Perez worked out of the bullpen to start the season because the Twins wound up with six days off in the first 16 days of their schedule, including one weather postponement. He gave up seven hits and two walks while striking out five. Baldelli took his first career ejection in the eighth inning, when Cron struck out swinging at a pitch that hit both his fingers and the bat. Baldelli calmly argued for a foul ball, but home plate umpire Mike Eastbrook eventually gave him the heave-ho. The play was not reviewable. "That's just the kind of guy Rocco is," Cron said. "He's going to have our backs." The Blue Jays will let second baseman Lourdes Gurriel Jr. decide when he's mentally ready for action on defence, planning to initially use him as a designated hitter with Triple-A Buffalo. Gurriel was sent down on Sunday, after a second throwing error in as many games. "I felt like his dad talking to him. That's tough, what he went through. We're here for him," Montoyo said, adding: "Whenever you say you're ready to play in the infield, we'll play you again, but it's all about you. Take your time. No rush." Blue Jays: LHP Ryan Borucki (elbow inflammation) moved to the 60-day injured list, pushing his eligible-to-return date back to May 27 to make room for Eric Sogard. ... Biagini subbed in the closer role for RHP Ken Giles (illness). Twins: Willians Astudillo played 3B for Marwin Gonzalez, who was given a break amid a 5-for-34 start to his first season with the team. RHP Aaron Sanchez (1-1, 1.69 ERA) pitches for the Blue Jays on Tuesday night, with RHP Kyle Gibson (0-0, 7.71) taking the mound for the Twins.